The first sustained aeroplane flight in British skies took place in 1908, and was made by a former Wild West showman and friend of Geoffrey de Havilland (who later heard him die). When it comes to Hatfield the first mention of aeroplanes – found so far – dates back to 1911. A brief reference to a fleeting passage in the skies above led to an incredible story of wealth, privilege, innovation, sacrifice and a bombing mission that had an impact on two world wars. The first sustained aeroplane flight in British skies was made by an American, Samuel Franklin Cody, on 16 October 1908 at Laffans Plain (Farnborough). He came to Britain around 1890 as a Wild West showman and appears to have been inspired by the success of William Frederick Cody (better known as Buffalo Bill). Even to the extent of calling himself Colonel and adopting the name Cody – his real name is thought to be Cowdery, born in Iowa in 1867. Although, according to his Royal Aero Club pilot's certificate (No.9), in the name of Cody, he was born on 6 March 1861 at Birdville, Texas. He took his show on the road and across to mainland Europe for several years. Around the turn of the century he appears to have developed an interest in aviation and patented a system for a man-carrying kite in 1901. This eventually led to an order from the British military and his presence at the Balloon Factory (later called the Army Aircraft Factory in 1911, and ultimately the Royal Aircraft Establishment) at Farnborough. Here he became involved in balloons and airships – serving as co-pilot on the British Army airship Nulli Secundus (Latin for Second to None) with Colonel J E Capper on a flight between Aldershot and Crystal Palace in October 1907. After having conducted varied tests and trials there for three years his involvement ended in April 1909 but he was allowed to set up his own centre close by. Here he was frequently visited by Geoffrey de Havilland. He became a naturalised British citizen in October 1909 (possibly motivated by the conditions attached to aviation cash prizes on offer at the time). He won a number of aerial events and competitions. In August 1912 he won the Military Aeroplane Competition held at the Larkhill Camp on Salisbury Plains (which led to him being awarded the Royal Aero Club Gold Medal that year). Sadly, Cody and his passenger (former Oxford and Hampshire cricketer W H B Evans) were killed early in the morning of 7 August 1913 when their aircraft disintegrated in midair over Farnborough. Geoffrey de Havilland, who was still in bed at the time and had known him from Nulli Secundus days, heard the engine suddenly cut out (in a curious coincidence, the plane was an all new construction apart from one component – a spar from Nulli Secundus). Cody was buried with full military honours, and the King sent a message of condolence to his wife and sons through General Sir Douglas Haig. It is difficult to tell for certain when the first heavier-than-air craft flew over Hatfield. 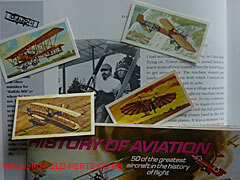 The first aeroplane flight in the UK was in 1908, and the first dedicated aviation publication only started at the beginning of the following year. Without any navigational aids apart from maps – of limited use in a windy, open cockpit – early aviators used reference points on the ground – hills, buildings and other landmarks and by following roads and railways to find their way around. With Hatfield's prominent position on the Great North Road and the Great Northern Railway (and branch lines) – essentially, the main route from London to Edinburgh – it was bound to have been overflown at a very early stage in British aviation. Strictly speaking, this first aeroplane visitor had as much association with Hatfield as today's travellers passing through the town by road and rail – and they're likely to be moving a lot faster than his primitive aircraft. Still, his story is a remarkable and moving one – and it includes some other links to Hatfield.